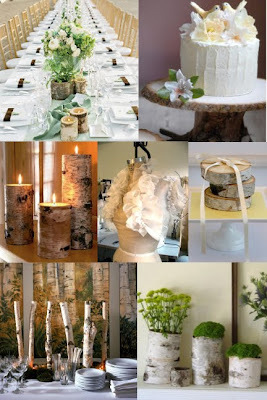 I got a message from one of my favorite college roommates* a few days ago saying that she'd had a dream that she got married and there were birch trees all around and thought it would be a good idea for me to write a post about. Well I couldn't agree more! I love birch trees. The bark is so beautiful and I love the clean lines of the trees. I think it's the perfect touch to incorporate into a fall or winter wedding and am so happy S decided to tell me about her dream. Hopefully this board will do it justice! *Not only is she just an awesome person, but we also took the same studio art classes together all summer long so I really got to know her better. We had only known each other for a semester when we decided to live together that summer but both wanted to stay in Athens for the summer so we just went for it and found an apt to sublease. Guess it was a little risky, and I can only speak on my part, but I'm happy we took the risk because she was such an awesome roommate! Now she's studying to be a nurse and I am so proud of her! She's going to do such an amazing job at it.